A few weeks back we posted an interactive map that shows what each tax return filer will see as a tax hike when averaged out. The map is broken down by state and provides a profound glimpse in to what is ahead of us. Please take a moment to see what’s ahead. Click here to view the map and find out what your state will face in 2013 on our current path. Today there is a follow-up post showing how the Obama taxes will completely pummel even the lowest income congressional districts in the nation. The poorest district still carries an average tax hike of $1,236 per filer, which is a brutal increase and destroys Obama’s promise that taxes would not go up once he passed his tax hiking healthcare law (how is a promise like that even possible?). This is a tax hike we simply cannot afford. We’re already taxed at levels higher than those that started the American revolution. 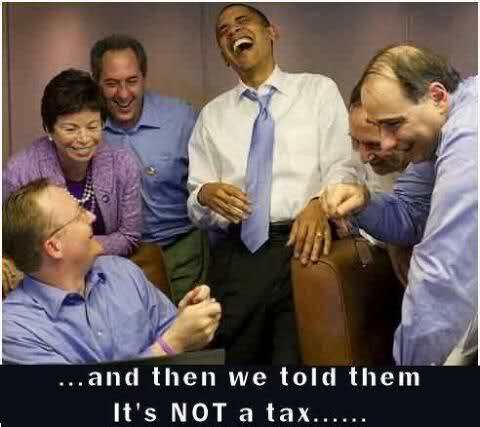 The thought of even higher taxes under Democrat rule in 2013 is unnacceptable. You can help right now by clicking here and tossing a few bucks to the Patriot Super PAC. Seriously, the ONLY way we’re going to be able to correct this coming collapse is to strengthen cnservative grip on the house, win the Senate and send Obama packing. Click here to contribute to the Patriot Super PAC now. President Obama said his healthcare law is here to stay during a sweltering campaign stop in swing- state Ohio on Thursday. Obama touted the Supreme Court’s decision to uphold his signature healthcare reform legislation to cheers from a crowd of his supporters. “The law I passed is here to stay,” he told an audience composed largely of Ohio automobile manufacturing workers.